Case Study - Fraser Health - A Digital Marketing Agency | IIAS - International Internet Advertising Services Inc. The soonest surgery tool is based on statistics gathered for the Ministry of Health Wait Times website. The results change regularly based on the number of patients referred to each surgeon and the amount of time available in operating rooms. 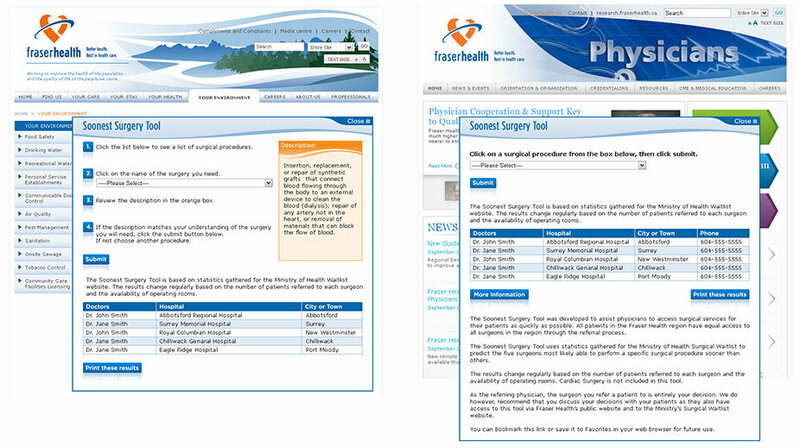 On June 25th,2014 Fraser Health won the Award of Merit – Top Innovation at the Excellence in BC Health Care Awards for their new surgery web pages and the Soonest Surgery Tool. When Fraser Health moved from locally managed surgical programs to a regionally managed system, patients had access to any surgeon in the region. Joanne was working with them to create new web content and other materials to ensure that patients and physicians knew about this option. As the project proceeded, it became evident than in order to take full advantage of the benefit of region-wide referrals, there needed to be a method of identifying all of the surgeons in a particularly specialty, and which ones were more likely than others to have shorter wait times. Some information was being published online by the Ministry of Health, but this was for a different purpose, and was difficult to access and interpret. The initially small project team envisioned something much more user friendly, that would include definitions for the various surgical procedures so patients would be confident that they had made the correct selection; and that would provide only the names of surgeons most likely to have the shortest wait times. … and a mock-up of what the search results might look like. Fraser Health said they would be delighted if such a tool could in fact be produced. Team members expressed concern though with using the readily available public data as it was only updated quarterly and did not account for a number of variables. Digging deeper into the sources of data, the team learned that the Surgical Patient Registry (SPR) at the Provincial Health Services Authority (PHSA) was the repository for data on all surgeries booked and completed. With approval from PHSA, the SPR Manager and several other data analysts and technology specialists officially joined the team. We also brought in our very own mathematical genius and data architect. Over the next several weeks, the “data” team members analyzed the available data, proposed, tested, and revised a series of algorithms that would produce the desired results. Other members of the team were dispatched to work on the user interface, write plain language definitions for all of the surgical procedures, investigate and resolve any data privacy concerns, and develop a hosting strategy that would not conflict with IT security policies of Fraser Health or PHSA. Facilitated the work of a virtual team of data managers, database architects, web designers, programmers from four different organizations, and resulted in the creation of an award-winning web application that is easy to use and provides exactly the information the user needs. Team members were dispatched to work on the user interface, write plain language definitions for all of the surgical procedures, investigate and resolve any data privacy concerns, and develop a hosting strategy that would not conflict with IT security policies of Fraser Health or PHSA. Analyzed the available data, proposed, tested, and revised a series of algorithms that would produce the desired results. Interested in getting these type of results for your business?